Modern Mexican small bar with more tequilas on offer than you could throw a donkey at. El Publico was reviewed on Thursday 3rd May 2012 18:45 by Richard. Over the past month or so I've been hearing quite a lot about this new Mexican place in Highgate, mostly positive things besides a few people saying it's over priced (which, after our visit, I think I’m on the fence about). So a group of four of us decided to check it out and headed down to El Publico for a meal and some mid-week cocktails. The decor is really great - quite simple and modern like most Mexican restaurants and there is a massive neon donkey behind the bar which gives the whole place a kind of freakish red glow. We were greeted by a waitress as we walked in and being there quite early, we were able to pick any available table we liked. Service on the whole was good. Our waitress was bubbly and friendly and the wait times for food and drinks weren't long at all which was great, especially since it started to get quite busy after we arrived. The menus seemed huge and the first thing you can't help but notice is the vast number of tequilas on offer (well over 50). I never even knew that there were that many varieties of tequila available in Mexico, let alone in a Mexican bar in Perth. Unfortunately for me I have had one too many bad experiences with tequila so I opted for beers instead, but the rest of the table ordered a few different tequila based cocktails and on the whole they were quite good. I hadn't had Mexican food for a while so I was really excited when going through the menu trying to decide on what to have. 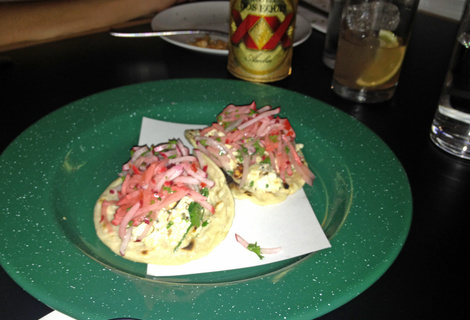 The menu has quite a good mix of traditional Mexican dishes as well as ones with more of a modern spin. The dishes on the menu are recommended to be shared as they are tapas style servings, so we ordered; beef and grilled cheese tacos (2 tacos per serve), 'street' style prawns, fried chickpeas, pan fried fish, slow cooked pork belly and cheese & radish tacos (2 tacos per serve). It sounds like a lot of food, but the serving sizes are quite small and between four of us it was just enough to pass as a light meal. On the whole the food was quite good especially with a drop or two of "Sam’s hot sauce" (warning: it's pretty damn hot). 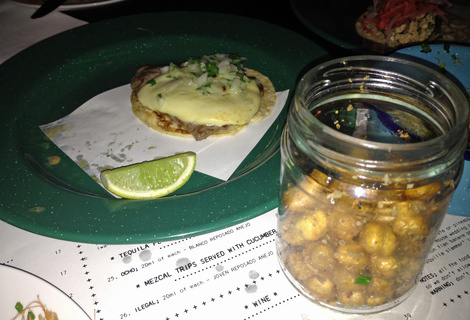 The standout dishes would have to be the beef and grilled cheese tacos and the fried chickpeas with tortilla salt. 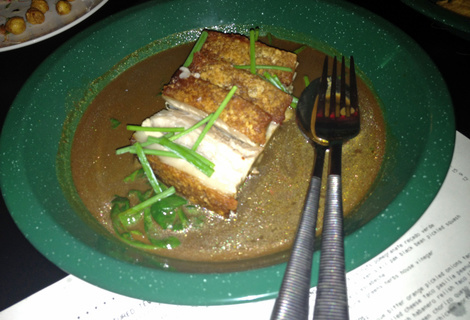 The pork belly was quite good too but I wasn't a massive fan of the chilli chocolate sauce. We also ordered a couple of desserts, the peanut butter ice cream was amazing but the nicuatole mousse, in my opinion, tasted like milled nachos in whipped cream and not to my preference, so this one may be left to the more adventurous foodie. On the drinks side, the imported Mexican beers and cocktails were great. The cocktails were made with good ingredients and plenty of tequila, which you would expect for around $20 each. This brings me on to the value, the bill came to a little over $60 a head for a cocktail (or in my case a couple of beers) and food. Considering it ended up being a rather light meal and we only had $20 worth of drinks I think it is a little on the pricey side. If we were to forego the drinks, for a similar price, we could've all had a steak at Rockpool. All that said, I think you are always going to pay a bit more for tapas style meals vs. just getting a main meal, I just think if the food on a whole was absolutely amazing instead of above average then I wouldn't mind paying that bit extra. 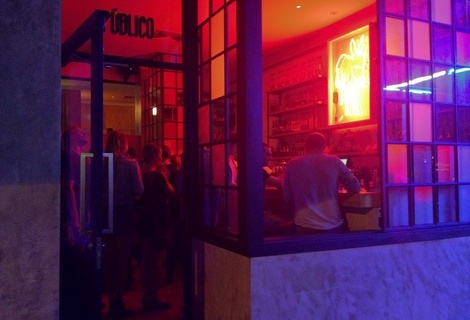 I still think that El Publico is a great place for a cocktail and a light meal and it's great to see more small bars like this opening their doors outside the Perth CBD. Next time you're in Highgate or have a craving for some good tequila make sure you swing past El Publico. 8/10Queens Tavern in Highgate, WA (36m away)Laid back pub in a sea of poshness. 8/10Five Bar in Mount Lawley, WA (156m away)One of Beaufort Street's best small bars.